It’s vital that your car registration details are kept up to date, but fortunately, the DVLA will issue you with an updated certificate free of charge. You will need to update your car address details within four weeks. The process of changing your details is fairly easy. You can update your driver’s licence online on the DVLA’s website, or by posting it back to them so that they can amend it for you (see below for the address). However, changing your car’s log book requires a little more effort on your part. 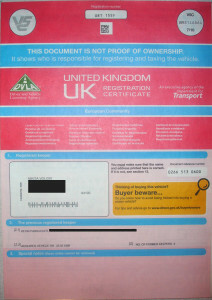 As part of the European Directive 1999/37/EC, the UK (along with other members of the European Economic Area) is required to have all vehicles registered to an individual ‘owner’. Your vehicle registration document is called a V5C but is more commonly referred to as a “log book”. To change the name and address details associated with your car, you simply need to fill in the “red form” and send it to the DVLA for processing. Alternatively, if your road tax renewal is due in the next four weeks, you can take your V5C to the post office and update your name and/or address details at the same time as taxing your car. Remember to take a photocopy of your MOT certificate along with you. Your new V5C with your updated details will be posted back to you within four weeks. The DVLA ask you to allow 6 weeks for it to arrive before contacting them to chase. Previously, V5Cs were blue and were referred to as “blue forms” instead of red. In 2008, more than two million blue forms were stolen from the DVLA. Subsequently, the DVLA revised and re-issued the forms. They’re now clearer and more user-friendly; they’re also red to distinguish them from the older, potentially stolen, blue forms. Blue forms may still be in circulation, being used to provide false identities for stolen cars. However, as of September 2012, the last of the legitimate blue forms expired, which means that all legitimate V5C forms should now be red. You should also bear in mind changing your vehicle’s engine, fuel type, cylinder capacity, chasis, number of seats, body shell or colour will also need to be changed on your registration document. You’ll just need to notify the DVLA in the same way as updating your name and address details. What about personalised number plates? Personalised number plates are available for all vehicles that are registered in the UK – and the industry for personalised plates is big business. Motorists who can afford the costs of private plates get the chance to drive their vehicle(s) with a distinctive, often personal, number plate. Personalised registration plates can be purchased directly from the current owner of the plate, or you can buy them via DVLA plate auctions. When you purchase a personalised plate you need to tell the DVLA about it via what is called a V750 certificate of entitlement and a V778 retention document. You will also need to provide the vehicles V5C form and, if the vehicle is over three years old, an MOT test certificate. You need to be aware that there are specific rules and regulations governing personalised plates. For instance, you cannot apply a personalised number plate to a vehicle in a bid to make it look newer than it actually is. When you have applied to the DVLA with all the relevant documents, they may wish to inspect the vehicle before approving your plate. If not, then you should get your personalised plate approved within about two weeks.